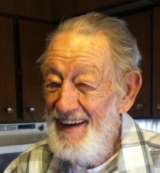 Otto Thomas Rupp, Sr., 91, passed away on September 5, 2014 in Mesa, Arizona. He was born September 23, 1922 in Baltimore, Maryland. A Memorial Service with full military honors will be held on September 23, 2014 at 10:30 AM at the National Cemetery of Arizona, 23029 N. Cave Creek Rd., Phoenix, AZ 85024. Offer Condolence for the family of Otto Rupp, Sr.